A Hamilton win will be make it more of a surety 2018 title his. After a storming qualy lap for pole on a track which would've favoured Vettel / Ferrari, it caught all by a pleasant surprise. Tomorrow's race should be awesome. Should be some race, hope it all stays clean at the start, especially given that 2 of the front 3 were protagonists in the carnage last year. What pleasant surprise? Another Merc win? Anything can happen on race day, Vettel wins and Hamilton DNFs then it is game on for the title. However, I think tomorrow represents the first opportunity for Vettel to basically lose the WDC. If Hamilton finishes P1 or P2 and Vettel doesn’t score points it’s almost game over for him. Nothing to do with Vettel/Ferrari being poor? Hamilton has been superb this season. It was a surprise all right, but I don't know that it was pleasant for most people who aren't Hamilton fans! The championship is pretty much dusted if Hamilton wins here. Oh yeah today was a surprise but Hamilton has been driving on a better level to Vettel for a while now. Some posters need to realise they need to look closer to home at Vettel and Ferrari this season than believing something which isn't true. There are still 300 points up for grabs after this race - it won’t determine anything. It can be a very unpredictable race and how many times this year have we seen the guy on P1 lose places off the line or DNF. 150 points to play for after this race, 6x25. The pole sitter has finished in the top 2 in the 8 of the last 10 races. 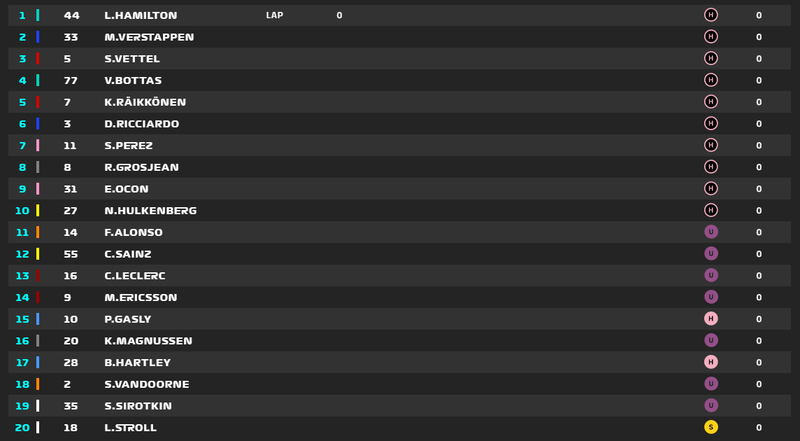 The exceptions being Vettel crashing in Germany (from the lead) and Bottas retiring with engine failure in Austria (from P2). Pole sitter was been top 2 in 10 of the 14 races, the only other 2 times were when the SC screwed Vettel in both China (running P2) and Baku (from the lead). Anything can indeed happen but pole man has been on to finish in the top 2 in every single race this season, a bad timed SC is the biggest danger. Fastest option is a one-stopper - Start on ultrasoft for 24 laps, then soft to the flag. This isn’t an option for the top 10. Nearly as quick is another one-stopper - Start on hypersoft for 13 laps, and then soft to the flag. Next best option is a two-stopper (which is nearly as quick as a one-stopper) - Start on hypersoft for 11 laps, then two stints on ultrasoft of 25 laps each. 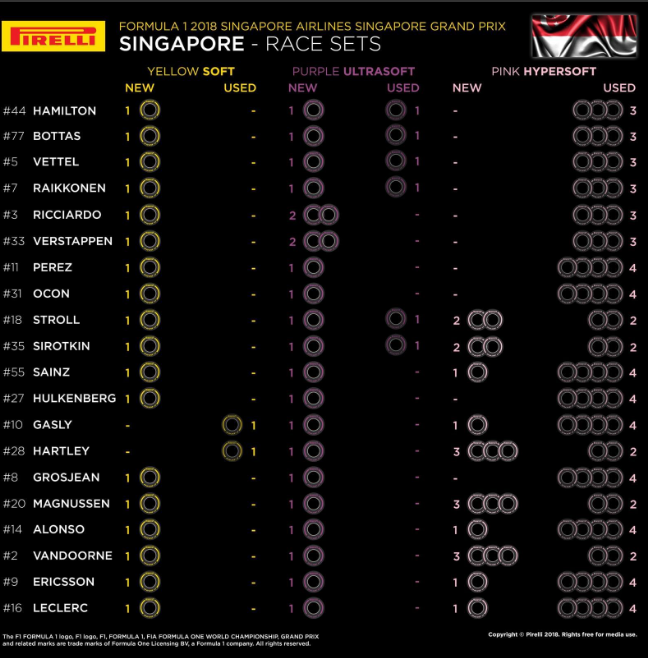 Singapore has never been a 1 stopper since Pirelli came into the sport in 2011. I think we will see some strategy today. Hoping for a Verstappen win, apparently their long run pace was the best so if he can take the lead at the start I think he can do it. Lap 1 could be interesting especially down into turn 6 (?) after the long straight. Vettel needs to finish ahead of Hamilton so I'd expect him to be punchy and with Verstappen involved there's always the chance of sparks flying. Looking forward to this one. You know F1 do this live build-up stream? Yeah. If You're following F1 on Facebook, You get a notification about this live event. It's great to watch this. Also noticed in today's live stream build up, Ocon & Stroll were still walking & talking together before hopping into their respective cars. Surprised at this considering Stroll will be taking Ocon's seat. Seems like their friendship will last last longer irrespective of Ocon's F1 future in doubt. I just want to apologise for the servers being their usual pain in the backside. We're working on it, hopefully this will be the last race weekend affected by it. Fingers crossed, and thank you all for your ongoing patience! With Max being on the inside and having nothing to lose I can already see Hamilton going round the bollard and losing places, alot better than going to the back of the grid on a street track. Lewis is in a position where he can let Max go at the start. Below 10th, Most of them starting on Ultras bar Stroll on Softs! I'm sure Ferrari have control of the SC button, Spa and Singapore straight after the passes then Monza didn't even need one. Those HAAS drivers really love to cheat. Hopefully Grosjean gets some penalty for that. I mean you can't just completely cut a corner for the hell of it lol. Find it hard to believe that Perez did not know that Ocon was there? Was it KMag in the Haas that cut yet another chicane at the start of a race? Grosjean takes the gherkin. He wouldn't have been in the way of the FI 's without the cut. Exciting to see HAM VET setup for a good scrap at the restart! Why would he? He'd have been looking at the Haas appearing out of nowhere. Even if he did see him there was still loads of room left. Both drivers were turning. Ocon was just turning more. No further action. But taking my mod hat off for a moment, I agree with you that it was a dodgy move. I think all of them are just nursing their tyres. Or possibly he's trying to bring Max and - more likely - Bottas into play against Seb, trying to extend his WDC lead further. Risky but on a street circuit like this, not the worst plan ever.